Saturday morning Alan and I marked the opening of the CT trout season on a small stream in search of wild trout. Heavy rains began the night before and continued through the early morning causing the streams to be high and dirty. We started off at a spot where we opened the 2018 season with our friend Pete and his son. At the time, we didn't realize that it would be the last time we would fish with Pete. Before heading out into the rain, we chatted over coffee and some muffins in the truck, hoping the rain would let up but it didn't. The current and the muddy water was not encouraging in the early going so Alan suggested we try another stream nearby which was a good call. The second stream we fished was in a part of the state of CT that I had never visited in my 30 years of being a resident. The stream and the surrounding steep gorges full of hemlock, mountain laurel, and oak were all reminiscent of the Appalachian mountains. This stream was also swollen and off-color but we did find fish behind a rock or in a seam that was protected from the main current. 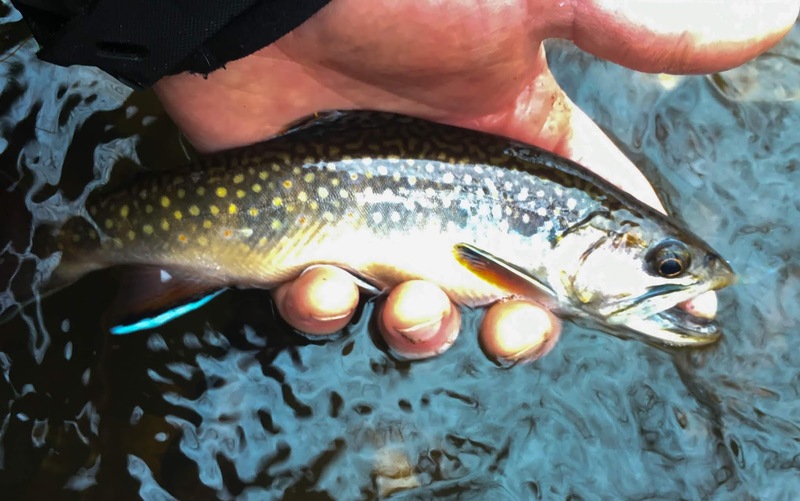 I landed three very nice brook trout and had a few more brief encounters. I was fishing a double nymph rig to get the flies down with a bright weighted green weenie on point and a Walt's worm on the tag. All the fish I landed took the Walt's. Alan took me up a tributary to see a waterfall and we fished the small tributary. The brook trout pictured below was hiding under the root of a tree. Both of us were surprised by it's size given the size of the tributary and how far we were from the main stream. On the hike back to the car, the rain had stopped and the sun was working on breaking through the grey clouds. We thought one more stream might be worth exploring. When we arrived, I traded my rain jacket for a lighter shirt and exchanged the mono leader with the two weighted nymphs for a dry dropper rig more suited for the stream we were about to fish. 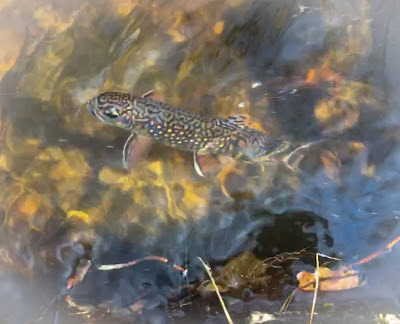 As I was switching out my gear I could see Alan working a brook trout out from an undercut. This stream had already started to clear and the brook trout were on the ready to grab a drifting dry fly. We both found brook trout in most every run that we fished. I stuck with the dry dropper since I was finding some of the larger fish were willing to take the dropper. After working upstream together it was time to say our good byes, content to have continued our opening day tradition and to have found fish under tough conditions. Mark, Nice work under difficult conditions. Persistence pays. Am currently in the beautiful Blue Ridge, but the streams took a heavy hit last night. Mark, a wonderful day on the stream. It started on the damp side but blossomed into quite the outing. Great report on a wonderful day. That brookie in hand is a real dandy from such a small stream. I wonder if all the rain we are getting is washing in plenty of chow for the resident trout. You and Alan are catching some plump ones. Sam- thanks, I don't know but you may be right! I landed another larger than this one but couldn't get a picture, it wanted it's freedom that bad!